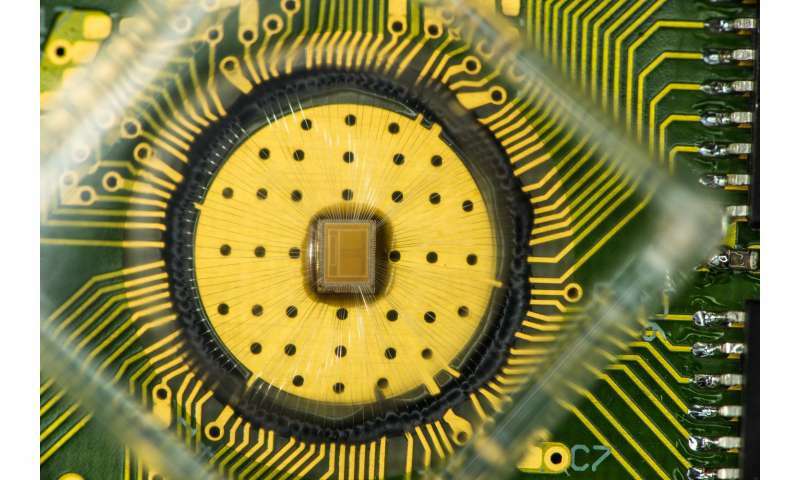 IBM scientists envision standalone PCM as well as hybrid applications, which combine PCM and flash storage together, with PCM as an extremely fast cache. For example, a mobile phone's operating system could be stored in PCM, enabling the phone to launch in a few seconds. In the enterprise space, entire databases could be stored in PCM for blazing fast query processing for time-critical online applications, such as financial transactions. "Phase change memory is the first instantiation of a universal memory with properties of both DRAM and flash, thus answering one of the grand challenges of our industry," said Dr. Haris Pozidis, an author of the paper and the manager of non-volatile memory research at IBM Research - Zurich. "Reaching three bits per cell is a significant milestone because at this density the cost of PCM will be significantly less than DRAM and closer to flash." More specifically, the new cell-state metrics measure a physical property of the PCM cell that remains stable over time, and are thus insensitive to drift, which affects the stability of the cell's electrical conductivity with time. To provide additional robustness of the stored data in a cell over ambient temperature fluctuations a novel coding and detection scheme is employed. This scheme adaptively modifies the level thresholds that are used to detect the cell's stored data so that they follow variations due to temperature change. As a result, the cell state can be read reliably over long time periods after the memory is programmed, thus offering non-volatility. "Combined these advancements address the key challenges of multi-bit PCM, including drift, variability, temperature sensitivity and endurance cycling," said Dr. Evangelos Eleftheriou, IBM Fellow. Nice. I wonder what the read and write times to each storage node are. It can be slower and still be very competitive. Keep in mind that each cell is three bits, not one. "To store a '0' or a '1' ... a high or medium electrical current is applied ... to read the bit back, a low voltage is applied. This is how re-writable Blue-ray Discs store videos." Optical disks, such as CD, DVD or Blu-ray (there is no "Blue-ray") use lasers to read and write bits, rather than electrical current, but, yes, crystalline/amorphous phase change is one way of encoding data on these disks. I'm still unclear how this new PCM memory achieves three bits per cell. We can go a lot smaller than 90nm. But even ten million write cycles is not going to revolutionize computing; this stuff is not usable for general-purpose RAM. On the other hand, it may easily replace hard disks with SSDs that operate at flash speeds, but last orders of magnitude longer than flash. For such a smart person, @compose, who knows a fair bit of electronics, you have some pretty weird ideas about physics. You might want to think about that. Maybe all those physicists know something you haven't figured out yet. It would be rather improbable, don't you think? Yep. You vs. 50,000 physicists, sorry you lose. Get over it. IBM scientists used four distinct resistance levels to store the bit combinations "00", "01" 10" and "11". In addition, depending on the voltage, more or less material between the electrodes will undergo a phase change, which directly affects the cell's resistance. Err, actually that's 3 bits, which is 000, 001, 010, ... 101, 110, 111. Eight levels FTW.